It is the experience, the knowing, the connection, the connectedness, the union with the One, with Source, with All. Love is a state of being that is akin, equal, to being in your natural state of divinity. And in that state, of your divinity, of your wholeness, there is no separation. GD: Hello, and welcome to An Hour with an Angel, with Linda Dillon, the channel for the Council of Love and author of The New You — Emerging into the Brilliance of Humanity’s Heart Consciousness. Joining her is Steve Beckow, founder of the Golden Age of Gaia and author of Building Nova Earth — Toward a World that Works for Everyone. Our guest today is St. Germaine. So, with that I’ll pass it on to you, Steve. Steve Beckow: Thank you, Graham, and welcome, St. Germaine. St. Germaine: And welcome to you, my beloved friends. Welcome to all of you, my cohorts, my allies, my beloved ones. It is my honor and it is my joy, and it is my play to take this time to be with you. In about one month’s time, you will celebrate — or I would ask you to celebrate — the occasion that is marked on your western calendar, or shall I say your Christian calendar, or shall I say your conventional calendar, as St. Valentine’s Day. It is the rarity that love is celebrated upon the planet and I wish today to make this rarity an everyday occurrence. So what I am asking today is that you will join with me in making St. Valentine’s Day a celebration of love starting right now. The Mother has spoken of the tsunami of love, the trickle that becomes the wave, that becomes the warm bath that you can all relax in, that becomes the ocean and the life blood of Gaia. When you celebrate, when you acknowledge, when you welcome love into your heart, your heart consciousness, your cells, your mind, your emotional body, your entire being, then what you are truly doing is uniting in heart with all — with each other, with yourselves, with your sacred other, even with your twin flame, with we who serve you with the Council of Love, with the Company of Heaven. There are so many matters on Gaia, upon the planet Earth, every day that occur and that we can chat about, and I am happy to chat about. But let us not forget individually and collectively, every single day, to celebrate, to welcome, to honor, to respect the core and the essence of the universe, and that is love. So, do you find me in a romantic mood this day? Yes, you do. But might I say if you were to inquire of me that you would find me in a romantic mood every day. So, with that opening, my dear hearts, where do you wish to begin today? SB: Well, I think it’s very funny, very apt, and almost unique, St. Germaine, that the next message that I have to deliver to you from one of our listeners, Tuesday on Heavenly Blessings you acknowledged Queen Isabella for her assistance during your lifetime as Christopher Columbus. I’d like you and our listeners to know that the woman who was Queen Isabella is incarnated in this lifetime, contacted me and sends you her thanks for acknowledging her. And I also want to add that I believe she was your wife in other lifetimes as well. St.G: And yes, I send my love right back to her. SB: There’s a bit of romance for you. [Laugh] Can I begin the program by asking you, please — and I do realize that we are approaching the tsunami of love, and perhaps we can work that in — but I do have a number of questions. The first is to straighten me and perhaps some of our listeners out on the subject of the ascended masters. I once assumed that the ascended masters were all fifth dimensional beings, but more and more I get the impression that they reside in dimensions much higher than the fifth. Can you correct my initial impression, please, and give us an idea of what dimensions you, the Masters Kuthumi, El Morya, Djwhal Khul and the others actually reside in? St.G: We can live wherever we want. How does that fit? SB: Well, I find myself struggling to have an accurate understanding. I don’t know. Are there only 12 dimensions? St.G: I am teasing you, my dear friend. So let us begin. St.G: We do not know why the belief that we are simply in the fifth dimension — where it has fully arisen from. But it does not really matter, does it? Because as you have advanced, as you have begun your Ascension process, as you have begun to more fully anchor in the fifth dimension, with Gaia, you have begun to look around and you have said, “Well, where is everybody?” Because you expected and anticipated our joyous reunion. But do not fear, dear hearts. We are there, and we will be there to welcome you fully and completely. But do we reside strictly, or singularly, in the fifth dimension? The answer is no. If you wanted to place us anywhere, you could place us in the seventh or the eleventh dimensions. The eleventh is the place of mastery, and the seventh, of course, is the place of love. And there are peculiarities, preferences, for each master depending upon their current undertaking and of course their overall mission and purpose. So, might I say, for example, the undertaking and the mission of Jesus Sananda is about love, and of course the anchoring of the Christ consciousness. And so where you would be most likely to encounter Jesus Sananda, Yeshua, or his other emanations, would in fact be in the seventh dimension. So think of it in this way: Our home port, our island, our anchoring spot, our gathering spot would tend to be the eleventh dimension, the dimension of mastery. But we are free and able to enter into all of the dimensions, including the twelfth, because that is within our capabilities, our purview. So it is where we primarily anchor, but we move…. You see… I am glad you have asked this question because it serves a multitude of purposes. Dimensionality…. You are tending to think of it as fixed, as stable, as not having penetrable walls. Now, you may think of this as various rooms in the castle of Gaia, but you are free to move from room to room. You’re also free to ask those rooms and the elements, the qualities, the diversity of those rooms to come to you as well. And for everybody in those rooms — yes, including myself — to come to you and to visit, to partake, to help, to assist, to share. So it is not a matter of being shackled into one reality or dimension. What has happened, in the old third — and you are seeing this more and more clearly — is that these false grids, these cement walls, thicker than the Great Wall of China, were erected and you were made to believe that you could only be there. In many ways you have been held prisoner by the collective illusions and beliefs. But those walls are coming down. They are but vapors, truly. And each of you, my sweet friends, my family, are seeing and feeling, experiencing elements of the fourth, of the fifth, of the sixth, of the seventh. So you are beginning to sense, and you are beginning to flow and to move, like we do. So if, for example, you send me an invitation — as you have this day and in this moment — for me to visit you in what we would call the renewed third, which simply means you are having a physical experience of my presence, of my voice, of my energy field, I would hope. We can do that, and we will ground this so that you will have greater and greater experience of dimensionality and being transdimensional beings. SB: Well, yes it does, and probably we’ll need a whole program at some point to really cement our understanding of dimensionality. But you have mentioned love, you have talked about love, and why don’t we return to that? I don’t think we understand love very well, St. Germaine. It’s all there is, we’re told, and yet at the same time it’s the basic substance out of which everything is made, and it’s also the glue that holds everything together, and it’s the force that transforms it as well. So it’s very hard…. I’ve had two experiences of love recently, one that made separateness disappear, and the other that made the point of consciousness that I am disappear and all my worries and anxieties with it. I don’t think we understand love very well. Could you please tell us more about what love exactly is, and what its place in the universe is, please? St.G: I am humbled and I am honored to have this question directed to me. And that is especially true because I can speak to you as brother. I can speak to you as friend because I have walked the world. I have traveled the Earth and witnessed her wonders, and I have also experienced the very limited understanding that the collective, even then, had of what love is. So let us talk about this. In the old way, in what we have referred to as the passing illusion of the old third, the completeness of love has been so limited, so misunderstood, and in so many ways — yes, even in my time — used as a commodity or even a weapon, a method of control. Love is none of these things. There is much written and poets have waxed eloquently about love being kind and considerate and selfless, expansive and extensive, but what is love, really? It is the experience, the knowing, the connection, the connectedness, the union with the One, with Source, with All. It is you, yes, in physical form, in your heart consciousness but also in all of your bodies, having the experience of being connected to God. It is ironic, because during the night this channel was asking me to more fully explain the Violet Flame. And similar to love, much has been written and expressed on the power of the Violet Flame — of which I am keeper, not master. And I always wish to make that distinction. You will see where I am going with this discussion. It is very difficult, well, it is not possible, particularly in your form, to have the experience of what you discern or distinguish as the Father, the masculine Source, because it is the unknowable, the unreachable, the unmovable. So you tend to associate love with the Mother, with the movement, and that is well and good, because love does move. It is an energy that moves, creates, moves through you, with you, around you, surrounding you in all, in the very molecules of air that surround you. The Violet Flame is the essence of the unknowable at that point of conjunction and love, creation, with the Mother. And it is a way for you to know the love of the Father as well. Now, how does one truly know or experience love? To truly know this is not a mental or emotional undertaking at all. It is a state of complete and utter surrender, and it is a state of being that is beyond what you think of as definition. It does not require definition. So often in the human reality, which is defined by time and space in many ways, there is a desire to measure things. How much do you love me? Do you love me enough to do X? I love you more than…. None of that is a definition of love. Love is a state of being that is akin, equal, to being in your natural state of divinity. And in that state, of your divinity, of your wholeness, there is no separation. So you are the love you give, receive, experience in every form, every cell, every molecule, every expression, every look, every glance. Everything you can think of is that expression of connection and creation. When the Mother has spoken, when Gabrielle has spoken of this being the time of recovery — I would say re-discovery — the rediscovery of who you really are, you are tending again in terms of measurement to think of your capacity to love. Well, dear hearts, your capacity to love is infinite and eternal because that’s the essence of who you are. And it transcends form, it transcends every lifetime, it transcends everything that you can possibly conceive of. You think of love, again, as a measurement of light, but it is more than that as well. The light of what you think of as light is simply an expression of that love. The desire of the unified whole, of the One, the Mother/Father/One, is to be known — yes, let that sink in — to be known not as Father or Mother, certainly not in any of the punishing ways that they have been portrayed in past. So, how, in the realm of creation, could you know the unknowable, the unseeable, in many ways the untouchable? Well, how you know is that spark, that essence that is implanted in your very core, your soul, your essence, your spiritual DNA, so that you are love, so that you will know love, so that you will be always, if you choose — but even if you don’t choose, my friend, it is still there — so that you are always in that state of being, of knowing, of the wisdom, of the sublime joy. How you come to know love in your form is through the expression — not the measurement, let me be clear about that — but the experience of being filled and overflowing with this wondrous sense of miracles, of magic, of unity, of knowing as you look at yourself in the mirror, or you look at your beloved, or you look at a stranger, that you are all one and connected, and interconnected, and all part of All That Is. This is key for you to know. 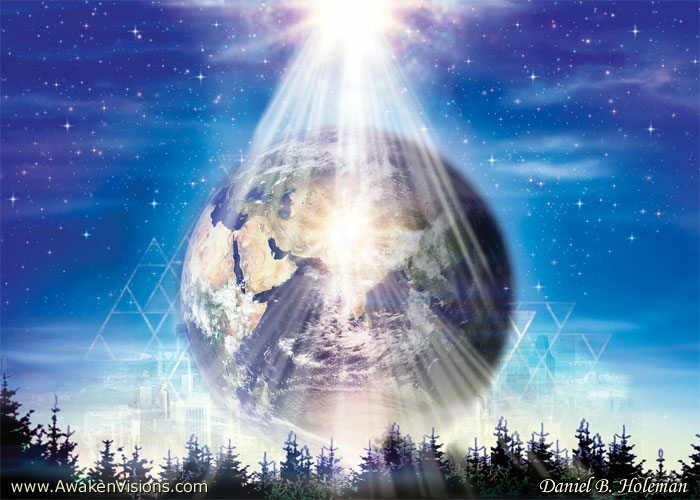 And it is on this level that you are able to connect not only with the kingdoms of Earth, but with your star brothers and sisters, with us, who are what you think of as the ascended masters, the enlightened beings of sheer energy, and, yes, the Source. So, what is love? Love is the completeness, the integrated, unified self in perfect balance, in perfect balance with the All. Now, how can that perfect balance ever exist? Think of it. If you were to use the scales of justice — Sanat Kumara would lend them to us, I am quite sure — and if you place your essence, your spark of divinity on one side of the scales, and then you place the totality of the One on the other, well, it would not be in perfect balance. Or would it? How do you bring this into the place of balance? Surrender and acceptance. As you accept more love from Source, from the heart of One, the scales come into balance. It is arranged by the Divine. It is created infinitely and in divine perfection that it comes into perfect balance because you allow yourself to be filled with the essence of all creation. In older times, and even in my time, one would retreat to the cave, to the monastery, to the ocean, to receive the silence and the spaciousness, the spiritual spaciousness to achieve such balance and to be in such quietude as to receive and to maintain, that is a whole other topic that we can talk about. But now, dear heart, it has shifted. This is part of your Ascension, this ability to be the love, to not have to quantify or measure, but to simply be that embodiment of divinity, knowing that it is beyond human quantification. And why would you want to narrow and package the expansiveness of All? That is what love is. SB: Well, thank you for that. And I… I do get that it’s very hard to put these matters into words, and I also get that just one experience of transformative love, not romantic love but transformative love, makes everything plain, everything that you’re saying, plain. But then to try to talk about is very difficult. St.G: It is difficult, but each of you — and I am saying each of you, not only you who are kind enough to join this circle tonight and listen, or to listen later; I am speaking of each person on the planet — is being given the opportunity, at this time and particularly through the Mother’s outpouring, to have and experience, so that it can shift into the knowing, the experience of this transformative love. Can you imagine the magnitude of this gift? And because you have the clarity to see and the purity to receive, it is open to each and every one of you. Now, will all accept? We certainly hope so. We do not know that. In fact, what we do know is that some will still turn away. And that is very sad, because it is the greatest gift of all. It makes being in human form, of being alive, not only worthwhile, but it gives you the sense of purpose, it gives you the fuel to be your mission and purpose, not to complete, not to work at it, not to undertake this task or that task, but to be the embodiment of your mission and purpose. Now, in the human experience, you are receiving glimmers about what this experience of love can mean as it transforms you, as it magnifies and grows you in new and miraculous ways. It is wondrous. So if you have not had what you feel… this experience of love that makes you understand that you are the love, then open your heart and ask for it, without qualification. Yes, we know the way of creation has been to clearly define what you want. And in partnership that we had formed this is the new paradigm that we work in tandem with you. But just for the fun of it, with me, can you just say, “I am open to receive, to experience love, so that I may fall back, fall forward, fall down and realize…” and become what you have always been, which is love. It is — yes, you are correct — it is the only thing that counts. Often, you will say they cannot see it, I have said you cannot measure it, but you most certainly, my beloved ones, you can experience it. And I say that to you as a brother who has walked the Earth and known deep, abiding love that has led me to the discovery of myself. SB: Well, it’s interesting that the tsunami of love will give us an experience of transformative love. I used to say to myself that I might have an experience of transformative love maybe one minute a year, if I was lucky, and in some years nothing, and that when I had that experience of transformative love it made everything worthwhile, all the struggle of the past few years. But now, if not with the tsunami of love, then with Ascension we’ll not only have the experience of, but it will be permanent, which really boggles the mind. St.G: It will be permanent. It will always be permanent. It actually always has been permanent, but it has, shall we say, been buried, unacknowledged, undiscovered in many ways, because of those walls that were erected, those illusions that took form. But yes, it will be, and it is becoming already, your new normal. SB: Well, thank you for that, St. Germaine, and I’d like to now segue to another matter which is of great concern to a lot of lightworkers who write to me. And that’s that they say that they’re dealing with very challenging situations in their lives. And some tell me that they feel discouraged with all the delays relating to the reval and the prosperity programs. Can you give us some reassurance about the subject of the reval and prosperity programs? We’ve been told a number of times that it’s right here, that it’s coming in a few days, but it never arrives. Can you reassure us that it is going to arrive in a very timely manner, please? St.G: I will address this, yes, but I will also address it in a number of ways, if you will permit me. St.G: And first of all, I do not wish in any way to dismiss or be seen as being dismissive of the hardships, the challenges, the difficulties that so many of you — some of you who listen, some of you who will never hear my voice — but the difficulties that you face in terms of this what you think of as financial pickle. Because that is what it is. It is a feeling of being squeezed and squeezed and squeezed until there is no breath left in you. My friends, I absolutely understand what you are saying. And it is hard for you to listen and have me speak of love, or for that matter universal law or divine qualities when you are feeling such pain. Or, might I say, that you are perceiving such pain and such limitation. Let me go back to speaking about love. What is currency, what is money, what are the prosperity programs? They are a physical expression of worth. The prosperity programs, of which I am very connected with, were born of love and a full understanding of this situation, that when you do not have food for your children, when you do not have the wherewithal to keep a roof over your head, that it is very difficult to engage in your spiritual journey. Now, there was a time in your evolution where it was much easier, in fact. Because what you would do, you would decide to follow a spiritual path and you would go to a nunnery or a monastery or an ashram and it would be taken care of. But the situation in which the spiritual life and the love life is to come forth has shifted so significantly that that is not really an option, and it is not an option that we are recommending. So then your question to me is really, “St. Germaine, what are you doing about it?” And yes, you have an expression on Earth — “Show me the money.” The money is there. And the money will be there. And it will be there in a timely manner. I would break faith with the channel if I were to speak of timelines or wherewithal, but I do say this to you. Listen very carefully to what I am saying to you. Love yourself. You can be angry and furious with us, but what does that do? It distance, it fractures our partnership — no, it can never destroy it, but it is like a couple who aren’t talking. It creates for difficult communication. But that doesn’t matter as much as the care, the nurturing, the attendance to your sacred self. So, how do you weather this terrible storm? The perfect storm? The death of chaos? The death of illusion? You do it by loving yourself in small ways and big ways, and knowing, reinforcing, re-declaring, every hour if necessary, your divine right and your worthiness. Now, you say to me, and I understand, “St. Germaine, it is difficult for us to focus on these lofty ideas when I am hungry, when I am worried about clothing my child, when the weather is inclement and I do not know if I have money for heating.” I understand, and I have been, in various lifetimes, in similar situations. There is probably very little that any of you have experienced that I do not have a comparable experience. So, I do not say this to compare notes; I say it so that you will understand what I am telling you. The way out, what you think of as the solution, is, in fact, the utilization not only of the love, but the expression of the love, which is the codification, the divine love that we have shared with you, so that you would understand how things work. So, rather than going with the old, which you know doesn’t work — it will never work, it has never worked — you go to what you know is the explanation of how creation takes place. If you believe — let us even move away from the knowing — if you believe that you live in an abundant universe, and you have only to look around you to see that, and if you don’t want to look at nature in the blessings and abundance of Gaia just look at the variation in financial wherewithal around you. Look at the fact that there are, shall we say, a select few that have massive abundance. And you say, “Yes, but so many got it by lying and stealing, and untruth.” That is true; but listen to what I say. There is abundance. And there is abundance in the multiverse. The Mother, the Source, the One never stops creating. So there is no shortage. Just use the one law, Above and Below/Within and Without, Attraction, and pull it with all your might to your deserving self. You are pulling, we are pushing. That is the partnership. And I assure you, failure, non-delivery, lost in the mail is not an option. SB: Okay. Well, thank you for that. I… before we run out of time I’d like to ask you about a certain circumstance that I see around me, which is that I see on certain blogs the Company of Heaven giving their message that the tsunami of love is coming and things are improving on all fronts. And then I go to some other blogs and they’re full of tales of the loss of civil rights and fears that the mainstream media censorship continues, and there’s still dark extraterrestrials around. Can you speak to that, please? Are the tales of the continuing loss of civil rights and continuing censorship and the continuing presence of negative aliens or extraterrestrials, are they true? Is that a true version? Or… where are we with emerging from the dark ages? St.G: You are emerging, and you have emerged. Now, what better way to keep you in what you have said and called the dark ages, what better way than to say that it is worsening, that it is continuing? These are the methods, the same methods — and I do not criticize the blog editors or the writers — but these are the same methods by which you have been enslaved and trapped and shackled in the first place. So it is a question — and only you can do this, each and every one of you — of very fine discernment. And it is also an issue of becoming the observer. And I don’t mean to disconnect from what is happening on your planet. Quite the contrary. But you are connecting in a different way. So those who want to maintain the chaos, who still feel perhaps handcuffed to the chaos, will, in fact, reflect on the chaos. Now, it is a choice. Do you wish to remain shackled, or do you wish to create the new? Not denying that there are still atrocities, that there are still invasions of civil rights and liberties — and you know that this is a favorite topic of mine. St.G: But I am asking you to choose the freedom. Send back into those situations the clarity, the purity. You also can be the amplifiers of the Mother’s gifts of clarity and purity. But do not engage in that because let us suggest to you that it is a tactic, it is a method to keep you in the old third. St.G: It is done with sweetness of intent on the part of some, and not sweetness of intent on the part of others. SB: But you see the irony in the situation, St. Germaine. What I’m talking about really is looking at other lightworker blogs. I’m not talking about the New World Order or something like that, but I’m actually talking about lightworkers, many of whom think… believe they get their information from insiders, so Pentagon people or CIA people, White Knights or otherwise. What I find so amazing and disturbing is that it’s lightworkers themselves who are reporting the stories of gloom and doom. St.G: Oh, yes. I am not referring to what you would think of as mainstream media, which is a whole other discussion. But in fact some of the sources that these lightworkers who only mean… whose intentions are pure, that they perhaps — and we cannot ever interfere with free will or choice, as you well know — but why they feel that it is news worthy to bring this to the attention of others…. But the totality of the focus cannot be on the…. All of you, all of you are working diligently with me, with Archangel Michael, with Archangel Metatron, with Jophiel, with Uriel, with Raphael, with many, bringing about the… what we would call the correction, the elimination, of those dark situations. But the more you engage in it, the more you give it energy. Think of it in very practical terms, seeing we have spoken this day so much about love. If you are in a couples situation and you are having an argument, a disagreement — and you have all done this — where you simply decide — yes, you choose — to stay angry, to stay mad, and you continue to pick at each other and to make snide comments and unloving remarks and unloving gestures, and you do not hold out the olive branch of peace, and then you drag up what happened last year, last week, twenty years ago, what your mother did to you when you were two years old. And you use it also as an excuse to fuel the fire of your anger. Then what do you have? You have a situation and a relationship that is on the verge of disintegration. It simply is diminished to the point where the love is not seen and being experienced. So I use this example. If you continue to pick and pick and pick and engage with the darkness, and the darkness within, then that is what you are creating. You have only begun to glimpse not only what love is, but what powerful creators you really are. We do not enter into sacred partnerships to create a new world, Nova Earth, Nova Gaia, Nova Being, with junior partners who do not know which end is up. Does this division within the lightworker community serve a purpose? This is me putting a good light on it. It serves a purpose insofar as those who see themselves as white hats, as you call them, as warriors, as whistleblowers feel that they are doing their job. But might I suggest that the job, the mission, is incomplete if it does not also include, in the channeling, in the article, in the work, the resolution, the remedy, the action to take in order to change and alter and eliminate such chaos. You are only doing half the job. So keep going, but complete the job. St.G: Because it is part of what you are doing is coming together as one community and coming to the understand that there truly is a new realm, and that the old is fading. Is it completely gone? No, but the last thing you want to do is reinforce it. SB: [laugh] Is it fear that is driving this continuing preoccupation with the dark and with the evil? And if it is fear, what is the way to get underneath it, get beyond it? St.G: It is fear, which you know is also often cloaked by anger. It is also a sense of working with the familiar. People are very comfortable talking, channeling, working with what they know about. So they know what they have known about. They do not fully know about the new. So it is a comfort zone as well. But the role of Nova Being is to live not only in courage but valor. So destroy, take your sword of Michael, take my Violet Flame and destroy the fear, my friends. Go with my love. SB: Thank you very much, St. Germaine. NextJesus Sananda ~ Who Are you?